Sweet mint tea warming a gold-rimmed glass. Vivid green palms against a backdrop of deep blue tiling. The smell of cinnamon and cloves wafting through the warm summer air. Morocco is a country that delights the senses. Whether you’re weaving your way around the winding medinas of Marrakech and Fez, or roving across the Atlas Mountains towards the golden Sahara, take your time. This unique Northern African nation is dense with flavours, sights and smells that will tantalise your travel tastebuds throughout your entire trip. From the bustling markets to locals’ humble homes, musky restaurants and quaint road-side cafes, grand palaces and abandoned Kasbahs, here are some of the sweetest delights to savour on a visit to Morocco. As far as souks go, Jemaa al Fnaa in Marrakech takes the orange-infused Moroccan cake. The largest market in the country, it’s nearly 1000 years old and is found in the medina, the maze-like walled old city. During the day the expansive courtyard is a mass of snake charmers, buskers, magicians, jewellery sellers and dancers. Food is limited to enormous piles of sticky sweet nuts and dried fruits sold in little brown goodie bags. But at night it becomes a busting food market with vendors wheeling carts laden with everything from snacks to full meals. Along with fruit and nuts you’ll find various flavours of colourful, aromatic tagines, skewers of meat cooked to perfection over charcoal and even braised camel hump served with doughy bread. At least three laps of the courtyard are needed before making any rash foodie decisions so take your time, snack on nuts and remember to bargain. A Moroccan meal is all about balance and one of the most popular meals, the tagine, will be every bit as sweet, spicy and salty as you can imagine. Served in the impressive clay cooking pot that gives the dish its namesake, lifting the lid off a tagine reveals a delectable chicken, sheep or vegetable dish that gets better with every bite. Some other delectable main meals in Morocco include B’ssara (a rich flavoursome soup of dried broad beans), Zaalouk (spice and smoky cooked vegetable salads), and Harira (a rich tomato and lamb soup). But the balance of flavours, spices and textures extends beyond the main meal and to the accompaniments that include sweet mint tea (also known as “Moroccan whiskey”), fresh fruits like oranges and grapes, sticky dates, soft pillowy bread and piles of light and fluffy couscous. 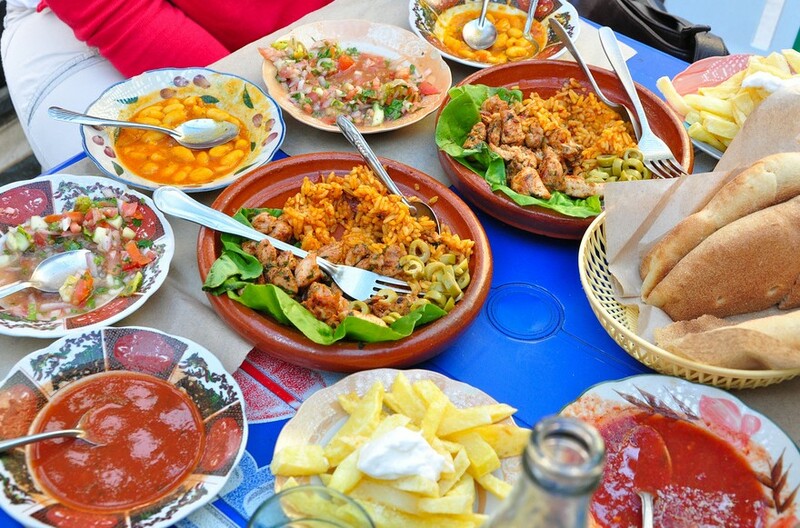 Moroccan people love communal eating so expect to be sitting along side some fellow travellers or locals and feel the love while dining on the country’s delicacies. As well as this, be prepared to eat with your hands. This time honoured traditions lets you eat with you right hand only, using your thumb and first two fingers, and also bread to soak up the food. Moroccan entertainment may also be part of the meal. Musicians and belly dancers performing traditional music add that final exotic twist to your experience. Tea is an art form and a performance in Morocco and there’s no better place to experience this than busy street-side cafes. Served in ornate silver teapots, spearmint leaves are steeped in hot water before a seriously generous amount of sugar is added. To mix, the designated tea maker will lift the teapot above his head and skillfully pour it from a great height into a tiny little gold-plated glass. He’ll repeat this process about ten or so times. Pro-tip: Go in the afternoons so you can sample the country’s famously dense and rich pastries perfumed with nuts and spices. Hospitality is of the upmost importance to Moroccan people and it won’t take long to be invited into a home or, if you’re travelling outside the cities, a colourful tent. The original inhabitants of Morocco are called the Berbers and while some live in the bustling cities, others inhabit villages scattered across the mountains and deserts; or choose to live a nomadic lifestyle, setting up tents near water wells and small towns. You’ll be offered tea, some homemade bread and sweets at the very least so the word “shookran” (thank you) will come in handy. The Jardin Majorelle, a 12-acre garden in Marrakech that transports you into an oasis of vivid green palms, bizarre looking cacti, ponds of exotic fish and a maze of vibrantly-coloured tiled walls. This garden is one of Marrakech’s most popular attractions and a haven away from the busy city. Visit the grand Royal Palace of Fez with its intricately decorated gold doors, blue tiling and green detailing. Get lost in Chefchaouen, Morocco’s blue city, where the ground, doorways and walls are painted in different shades of the cooling colour. Relax in a Moroccan hammam. Sweat out the day’s foodie indulgences at one of these traditional bath houses where, depending on which style of hammam you choose, you can have a massage, a face mask or simply bathe yourself in the warm water and use the sauna. Escaping the cities and heading out into the Moroccan mountains and desert is a spectacular experience if you’re looking for a full sensory experience. Your best bet is to take a tour out of town and travel along the meandering roads past oases of date-laden palm trees, abandoned Kasbahs and reddy-brown mud brick villages. You’ll wind up and over the rugged Atlas Mountains and stop along the way at cafes with views of what seems like the entire mountain range. Take your time venturing into the pink-tinged undulating sand dunes and follow camel hoof footprints to tented restaurants in the desert. At the end of your adventure, unwind at sunset with a sweet tea and watch the earthy landscape light up, reflecting colours in the evening sky. If Morocco isn’t on your 2015 travel list, your list needs a refresh! Experience this exotic part of North Africa with Contiki on their In-Depth Explorer trips including the epic 15-day Spain, Morocco & Portugal. Find out more here.